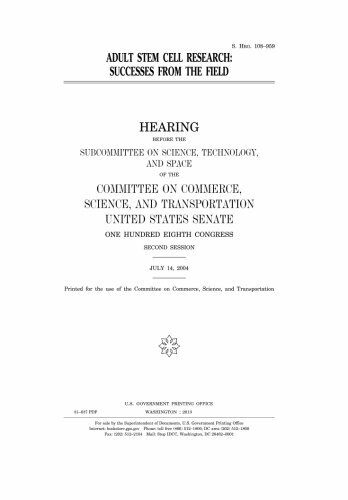 Adult stem cell research : successes from the field : hearing before the Subcommittee on Science, Technology, and Space of the Committee on Commerce, Science, and Transportation, United States Senate, One Hundred Eighth Congress, second session, July 14, 2004. Stem cell biology has drawn tremendous interest in recent years as it promises cures for a variety of incurable diseases. This book deals with the basic and clinical aspects of stem cell research and involves work on the full spectrum of stem cells isolated today. It also covers the conversion of stem cell types into a variety of useful tissues which may be used in the future for transplantation therapy. It is thus aimed at undergraduates, postgraduates, scientists, embryologists, doctors, tissue engineers and anyone who wishes to gain some insight into stem cell biology. 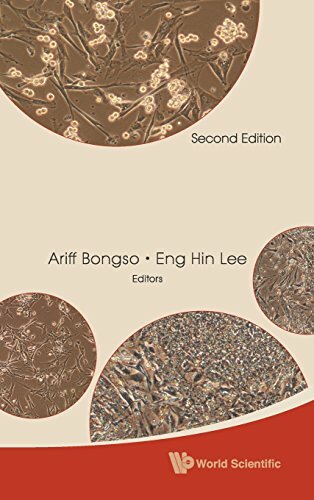 This book is important as it is comprehensive and covers all aspects of stem cell biology, from basic research to clinical applications. It will have 33 chapters written by renowned stem cell scientists worldwide. It will be up-to-date and all the chapters include self-explanatory figures, color photographs, graphics and tables. It will be easy to read and give the reader a complete understanding and state of the art of the exciting science and its applications. Defined as, “The science about the development of an embryo from the fertilization of the ovum to the fetus stage,” embryology has been a mainstay at universities throughout the world for many years. Throughout the last century, embryology became overshadowed by experimental-based genetics and cell biology, transforming the field into developmental biology, which replaced embryology in Biology departments in many universities. Major contributions in this young century in the fields of molecular biology, biochemistry and genomics were integrated with both embryology and developmental biology to provide an understanding of the molecular portrait of a “development cell.” That new integrated approach is known as stem-cell biology; it is an understanding of the embryology and development together at the molecular level using engineering, imaging and cell culture principles, and it is at the heart of this seminal book. Stem Cells and Regenerative Medicine: From Molecular Embryology to Tissue Engineering is completely devoted to the basic developmental, cellular and molecular biological aspects of stem cells as well as their clinical applications in tissue engineering and regenerative medicine. It focuses on the basic biology of embryonic and cancer cells plus their key involvement in self-renewal, muscle repair, epigenetic processes, and therapeutic applications. 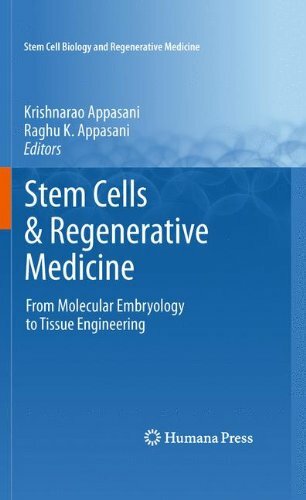 In addition, it covers other key relevant topics such as nuclear reprogramming induced pluripotency and stem cell culture techniques using novel biomaterials. A thorough introduction to stem-cell biology, this reference is aimed at graduate students, post-docs, and professors as well as executives and scientists in biotech and pharmaceutical companies.